Chevrolet Cobalt is one of the most affordable small cars on the used car market and the Cobalt coupe is the cheapest small sporty-looking car you can buy. Pontiac G5 is a rebadged version of the Chevy Cobalt. 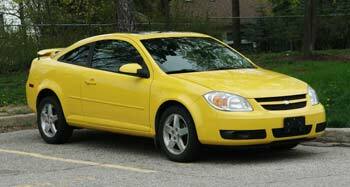 Chevrolet Cobalt is available as a four-door sedan or two-door coupe. The 2.2L automatic is the most common configuration on the market, so we will concentrate the review around this model. Problems: A problem with the fuel injectors in the 2.4L engine could cause the Check Engine Light with the DTCs P0171, P0300 and P1174. The related TSB lists replacing all four fuel injectors and reprogramming the PCM as a solution. An issue with the micro switch inside the shifter mechanism could cause a problem where the ignition key will be hard to remove because it won't turn into the OFF position. The micro switch inside the shifter sends the signal when the transmission is in Park. To repair this problem, the shifter assembly will need to be replaced according to the Technical Service Bulletin. A problem with the ignition lock cylinder itself also can cause the ignition key to be stuck. The ignition lock cylinder will have to be replaced. A GM dealer is the best place to call for either problem. The electrical power steering in the Cobalt drew a lot of complaints, but the GM had issued a recall in 2010 to address the issue, however, there are still some complaints about the electrical power steering even after the recall was performed. You can check for recalls at: Safety Recalls - NHTSA or Transport Canada - Road Safety Recalls Database. Powertrain: The 145-hp 2.2-liter DOHC Ecotec 4-cylinder engine was standard; the 171-hp 2.4L Ecotec was added for 2006. The transmission choices include a 5-speed manual or 4-speed automatic. Fuel Economy: The EPA rates the 2009 2.2-liter automatic Cobalt at 24/33 mpg city/highway (9.8/7.1 L/100 km), which is about average for the class. Chevrolet Cobalt can drive estimated 316 miles or 508 kilometers on one 13-gallon (50 liter) tank with 45% highway, 55% city driving. Interior: The cabin is fairly tight, seats are not very comfortable and some of the interior materials feel cheap. On the other hand, the visibility is good and controls are easy to use. 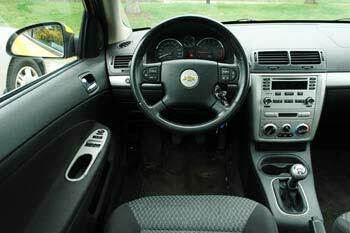 Another plus, the list of available features includes an auxiliary audio input, steering wheel audio controls, trip computer with oil life monitor, satellite radio and remote start. The trunk is large but the opening is small; the split rear seats fold down for longer cargo items. Handling and ride: On the road, the Cobalt handles well. The ride is comfortable. Other than some road noise, the cabin is fairly quiet. The 2.2L engine is powerful enough for a car of this size. Safety: Antilock brakes (ABS) were available as an option on lower trims; standard on others. In the NHTSA frontal crash tests, the 2005-2010 Chevrolet Cobalt received four stars for the driver and five stars for the front passenger. The side-impact crash test scores varied from two to five stars between different models. For details, check www.safercar.gov. Pros: Affordable, good engines, available premium features, the coupe is the least expensive sporty-looking small car you can buy, large trunk. Cons: Interior materials, seats are not very comfortable, small trunk opening, the handbrake handle is obstructed by driver's armrest. 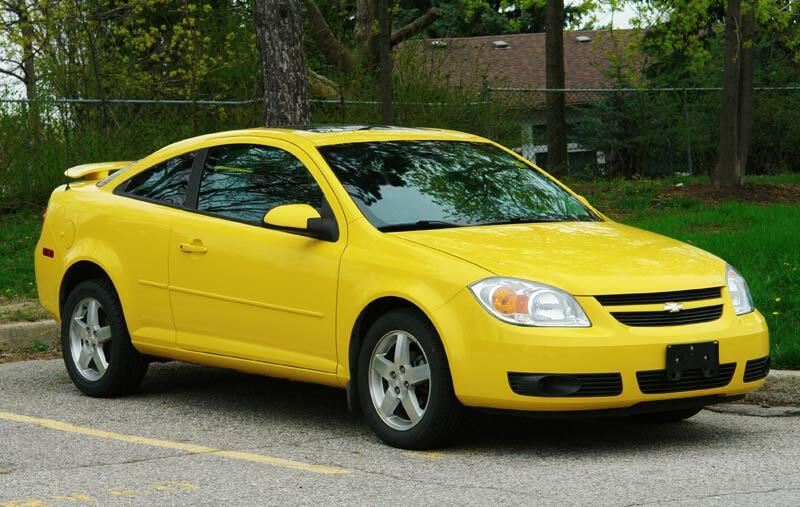 Overall: The Cobalt is neither the most reliable, nor the most comfortable small car, but a used Chevrolet Cobalt is cheap. Something like Honda Civic, Mazda 3 or Mitsubishi Lancer might be a better choice, but if you look at the prices, these cars are much more expensive. It might be a good idea to stay away from the 2005 and 2006 Cobalt, as they had more problems. On the plus side, the Cobalt's engine and transmission were mostly trouble-free. All four Cobalt engines have a maintenance-free timing chain; there is no timing belt to worry about. To the benefit of used car buyers, General Motors addressed some of the potential problems with several recalls. 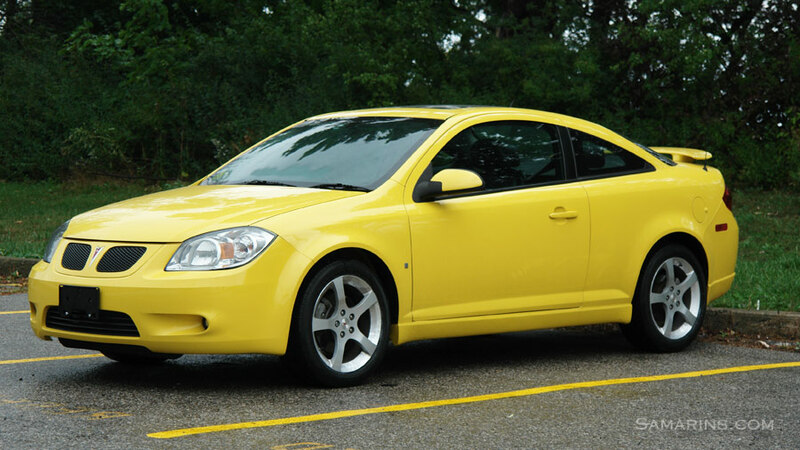 Pontiac G5 is a rebadged version of the Cobalt. Pontiac G5 is a rebadged version of the Cobalt; it was sold in the US as a two-door coupe. What to look for when buying a used Chevrolet Cobalt: It will help if you check several cars before picking the best one; it's easier to judge how the engine works or how the transmission shifts when you compare a few cars of the same model. It's a good idea to check with a GM dealer if all outstanding recalls have been performed. When checking a car at the lot, check for moisture under the front and trunk carpets; water leaks were not uncommon. Try to turn the steering left and right - there should be no knocking or clunking noises. Again, if in doubt, check another Cobalt to compare. Watch for oil leaks from the engine. See if the suspension struts are dry; if a strut starts leaking, it needs to be replaced and it's a few-hundred dollar job. Test how the air conditioner works; with the A/C on, the air from the vents should feel really cold. Test the audio system. Test all the power windows and locks. Under the hood, check the oil level; see if engine oil is not too dirty. If the oil level is very low, it may indicate excessive oil consumption, which is something to avoid in a used car. During the test drive, watch out for a knocking noise from the front end. See if the brake pedal doesn't pulsate during braking; this would indicate warped or corroded brake rotors. Read more how disc brakes work. Watch out for any warning lights coming on during the test drive. If any of the warning lights stay on after the engine is started, this indicates a problem. Read more here: how to inspect a used car. Before signing the contract, even if the car looks clean, have it inspected by a mechanic; it may save you some money. Maintenance: A couple of notes on maintenance: If you want to keep your car shiny, keep it clean and wax it every three-four months; car wax protects the paint. Change engine oil regularly. Your oil life monitor needs to be reset every time engine oil is changed. You can find instructions how to reset it in your owner's manual. Keep the interior of the car dry as water getting under the carpets can cause corrosion and mold smell. If the power windows are getting slower to open or close, lubricating the window guides with a silicone spray lubricant can help.